Who are the “former priests” referring to? About how many do you think there were totally? What is the difference with Jesus? What is the significance that Jesus’ priesthood lasts forever? What is He doing for us (those who draw near to Him) right now? List out the character qualities that Jesus, our High Priest, has as mentioned in these verses. What is mentioned in verse 27 about the differences of Jesus’ priesthood? What impact does this have on us? What does “the word of the oath” refer to? James 4:8 – Draw near to God and He will draw near to you. Luke 14:11 – Everyone who exalts himself will be humbled and he who humbles himself will be exalted. Hebrews 9:28, 10:10 – Jesus sacrifice is once for all. 2 Corinthians 5:21 – He was made sin for us. Verse 23 – Jewish tradition says that the number of Jewish high priests from Aaron to the destruction of the temple in AD 70 was 84. The number of total priests including all others besides the high priests would have been much much higher. These would die and then another would take their place. It’s kind of wearisome when you think about it. For millenia there were groups of priests who spent almost their entire lives serving in the temple to make sacrifices for sins. On and on and on with no end in sight. From father to son, entire generations of priests worked continually to offer sacrifices to cover over the sins of their people. They only represented a small amount of the world’s population. And they surely only offered sacrifices for a small percentage of the actual sins committed. And yet still they were kept busy without any breaks or rest. That is the problem of sin and the old covenant’s way of dealing with it. Verse 24 – Once again Jesus is contrasted with this priesthood. The Levitical priesthood was weak and inefficient. It was seriously flawed in that it could make no one perfect. It went on and on seemingly without end, but also without ever solving the problem. But (and this word in the Bible is so important), Jesus continues forever. This is really the hope that we have. Jesus is our perfect and final high priest. We need never have another one. Because He is infinite and enternal He can do the job required to take away our sins. And He can do it perfectly and completely whereas thousands of priests working all together could never be successful before. In the modern day world many times businesses will downsize. They will evaluate different departments and dismiss employees who are inefficient, unneeded, or just not getting the job done. Imagine if a company like Microsoft, Baidu, or Google came out with the following press release: “It has been discovered that our current business model is flawed. All of our tens of thousands of employees together cannot get the job done. Mistakes nad errors are commonplace. We are not fulfilling our company mission or purpose. To this point, our business history has been a failure. Therefore, every single employee will be fired effective immediately. We will replace them with one lone employee who will single-handedly right the direction of the company and perfectly fufill our vision and goals.” What would people say? “It’s crazy!” “No one can do that!” “Impossible.” “They have lost their mind!” Who is this guy?” And so on. Well, that is what Christ did. He singlehandedly replaced the entire Levitical priesthood. He is a priest permanently. No one will ever replace Him. He is able to save forever those who draw near to God – He is able to save. That is the good news of Christ. In the Old Testament we can see that people are hopeless on their own. No one can solve the problem of sin. The essence of the gospel is that Jesus can. Jesus can save. There is also a condition there. What is it? He will save those who draw near to God. In other words He offers the way out, but we also have responsibility to take the way out. Notice too the use of the word “forever.” This is a very important word. Why? It shows that salvation is not a temporary state. Those who are saved will be saved forever. Forever is a powerful word and it means what it sounds like. Once saved you can never be “unsaved.” This is yet another biblical verse supporting the fact that believers cannot lose their salvation. But remember all of the warnings we have read in the book of Hebrews about “not drifting away” or not “falling away.” We are still responsible to trust God and obey Him. He always lives to make intercession for them – This phrase gives us important insight into what Jesus is doing right now. One of His current roles is interceding for the saints (something the Holy Spirit also does for us). What does this show us about Christ? It shows us that He cares for us deeply. That He loves us. Returning to heaven was not abanding us. He is advocating for us before the highest throne in the universe. It is interesting to consider that Satan is the accuser who accuses believers before God while Jesus is the advocate who is making appeals on our behalf before the Father. What impact does this have on your life? How can this help you when you are facing trials or difficulties? What should you do knwoing that He is interceding for you? His sacrifice is once for all – This is an essential aspect of the gospel. At the same time it marks another difference with the Old Covenant. Under the old covenant, sacrifices were made for sins daily. It was ongoing and never ending. There was no final solution for sin. There was no answer. It was something like some diseases. For some diseases there is no known cure. The patient must take medicine for his whole life. This medicine can mostly treat the symptoms of the disease, but cannot actually cure it. Imagine the joy that patient would feel if on a doctor’s visit, the doctor informed him that a cure had been discovered. He could be 100% healed and not have to rely on taking medicine eveyr day anymore. That is how we should feel (multiplied many times over) because of Christ’s sacrifice for us. It was once-for-all. That means that He already died for all of your sins – past, present, and future. He wiped them all away. He doesn’t need to go the cross again. What impact does that have on you? We don’t need to keep going with the tedious daily sacrifices. Also, we are not saved and then unsaved and then saved again depending on whether or not we have committed a new sin. Someone said that if you sin before you die you will go to hell. But he is not taking into account these verses that show that Christ’s sacrifice is once for all. It was not only for past people, but also for future people. Verse 28 – The law appoints men as high priests who are weak. You can see a number of examples of this in the Bible. Why? We are all weak and we are all sinners so the high priest is no exception. It is called the word of the oath because of verse 21. God swore that the Christ would be a priest forever according to the order of Melchizedek. That was His oath and Jesus’ priesthood is based on this unchanging purpose of God. Application:How should Jesus’ character and what He has done for you change how you live every day? 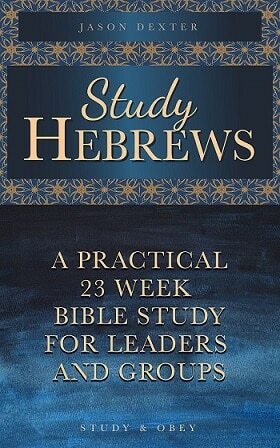 E-book: If this study is helpful for you, get the whole Hebrews study in one convenient e-book.